In this post I would like to share with you the best activities I know to teach the present simple tense. To achieve this, I will recycle some of the materials I have already and shared here. However, there are several new materials (for example the infographic) which I designed just for this post. I hope you find these materials useful and you will use them in your lessons. In my opinion, it is best to start a lesson on new grammar with a song. Play the following song to your students and ask them to complete the lyrics. Elicit what you are going to do in this lesson. You should get the answer that you are going to talk about things people do every day. The aim of the following activity is to sensitize students to the forms of the present simple tense and to improve their pronunciation. Play the following rhyme and ask the students to listen and then repeat it. In the last phase, students should read it on their own. It is a good idea to ask your students to memorise the rhyme. I have been using a different infographic for a long time, but it was a bit too complicated, so I decided to create a new one. Print the picture for everyone and explain that students should use the ending -s with the third person singular. You might want to teach the correct spelling of the -s ending, but I do not think it is a good idea. I believe, it is better to expose the students to the language now. Print the worksheet, so that every student has a copy. It is best to print the cards on a stronger paper. 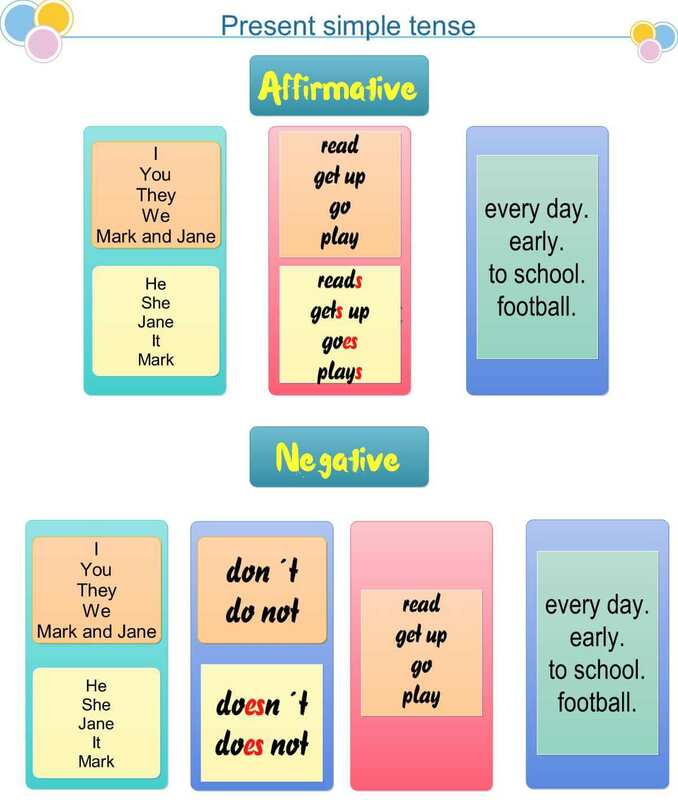 Ask the students to cut the cards and go through the cards and translate the expressions into the students´ MT. Students write the translation on the other side of each card. Then students learn the new words using the flashcards. Once they learn the words, play the following British Council video and ask the students to do the accompanying tasks. I think that tasks 1 and 4 are especially important. Collect the texts your students write and correct them to see what problems your students have. To practise the presents simple tense, I devised the following maze. Print the worksheet for everyone and tell the students to start in the left hand upper corner and go through the maze. They must make correct sentences in the present simple tense. They must go just right, left, up or down. They mustn´t go diagonally. They must go through each square just once and they have to finish in the right hand bottom corner. love your presentation; it’s easier to remember and recall when you are speaking in english. Although practice is necessary.